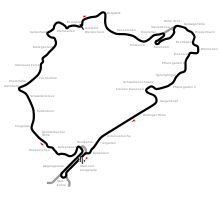 The 1973 German Grand Prix was a Formula One motor race held at Nürburgring on 5 August 1973. It was race 11 of 15 in both the 1973 World Championship of Drivers and the 1973 International Cup for Formula One Manufacturers. The 14-lap race was won from pole position by Jackie Stewart, driving a Tyrrell-Ford. It was Stewart's 27th and final Grand Prix victory, a record that would stand until 1987. Teammate François Cevert finished second, with Jacky Ickx third in a McLaren-Ford. The works March team did not participate in this race following the accident at the Dutch Grand Prix the previous weekend that had claimed the life of Roger Williamson. The Ferrari, Ensign, Tecno and Hesketh teams also did not participate. To boost the field, the McLaren, Brabham and Surtees teams all entered three cars: Ferrari released Ickx to drive the third McLaren; Rolf Stommelen drove the third Brabham in place of the injured Andrea de Adamich; and Jochen Mass drove the third Surtees. New Zealander Howden Ganley heavily crashed his Williams/Iso-Marlboro-Ford and the car could not be repaired in time for the race. Austrian Niki Lauda had outqualified his next-fastest teammate Jean-Pierre Beltoise by 8.2 seconds, but due to a suspension failure, he crashed at Kesselchen on the second lap, escaping with a broken wrist, but this accident forced him to miss his home race 2 weeks later. Belgian Jacky Ickx and Swede Ronnie Peterson battled for 3rd on the first lap, but at Breidscheid the failure of the alternator on Peterson's Lotus put him out of the race. He went across the Adenauer Bridge and stopped at Ex-Mühle, and spent the next 3 laps trying to fix the car. The race was rebroadcast in 2003 in the USA on Speed Channel as a special broadcast of their Formula 1 retrospective, Formula One Decade. Commentary was by Jackie Stewart and David Hobbs. ^ a b "Formula One World - History - German Grand Prix 1973". Archived from the original on 15 July 2007. Retrieved 27 June 2010. ^ "1973 German Grand Prix". formula1.com. Archived from the original on 3 September 2014. Retrieved 22 December 2015. ^ "Part1". Youtube.com. 2007-09-20. Retrieved 2010-12-12. ^ "Part2". Youtube.com. 2007-09-20. Retrieved 2010-12-12. ^ a b "Germany 1973 - Championship • STATS F1". www.statsf1.com. Retrieved 18 March 2019. This page was last edited on 2 April 2019, at 23:46 (UTC).